The quick and simple customer review strategy you can use to easily get more photography reviews. Ever wonder how some photographers get so many online reviews? There’s a secret that you might not know about that I’ll share in a second. Lets say you’re headed snowboarding for up to Toas, NM for a day in the powder, but you don’t have any of your own gear with you. Up pops Cottom’s Ski Shop. 2 different listings, each with over 100 five star google reviews. 1009% more reviews than the next ski rental place! Who would you rent your ski gear from? Or the place with 232 reviews and 4.9 stars? How did Cottom’s get this many reviews? Is their ski gear 10 times better than the next ski place? Are their prices 10 times cheaper? Wow – Now that’s great marketing! If Matt had a great experience (which he did) why not score a quick five bucks? When you think of ALL the travellers from out of town, paying $5 is a small price to pay for all the extra business you’ll generate from having 10 times more reviews than anyone else! You could avoid this by only emailing customers who were thrilled with their experience… but negative feedback can actually be incredibly helpful. If there is something you could change to make your business better, you’d want to know about it, wouldn’t you? When you click “Yes” on their email, it takes you straight to their Google Review page. Cool huh? But if you click “no” it DOES NOT take you to their Google Review page. Instead, you’re directed to a short survey form that get’s sent directly to Cottam’s Ski Shop. This allows Cottam’s to hear negative feedback and fix it without it being posted on google. You can set up a similar feedback survey in about 10 minutes for free using a Google Survey, or Typeforms. For example, I just googled “click here button png” and found a button I liked. Then in my email, I insert the button image, edit the link, and its ready to go. I can then save that email as a template for quick and easy access whenever I need it. Want the ultimate marketing resource? Whenever I deliver my clients their images, I send them a quick email template I’ve created asking them to leave their feedback + review my business. The result? 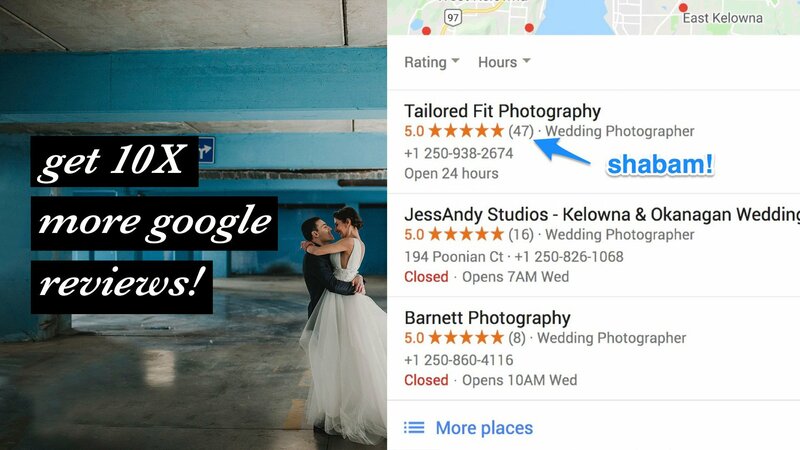 I have 2.5 times more 5 star google reviews than any other photographer in my city. I can then take the best of these reviews and post them directly on my website, and include them in my client pricing guides. This makes a huge difference both in bookings AND in showing up in google search. Its win win. Do you already have a simple system in place for gathering reviews? If not, are you planning to set one up? Grab the email template I send to clients to get reviews! Get the exact template I send clients after a session to get more reviews. how to increase your google reviews for your business!